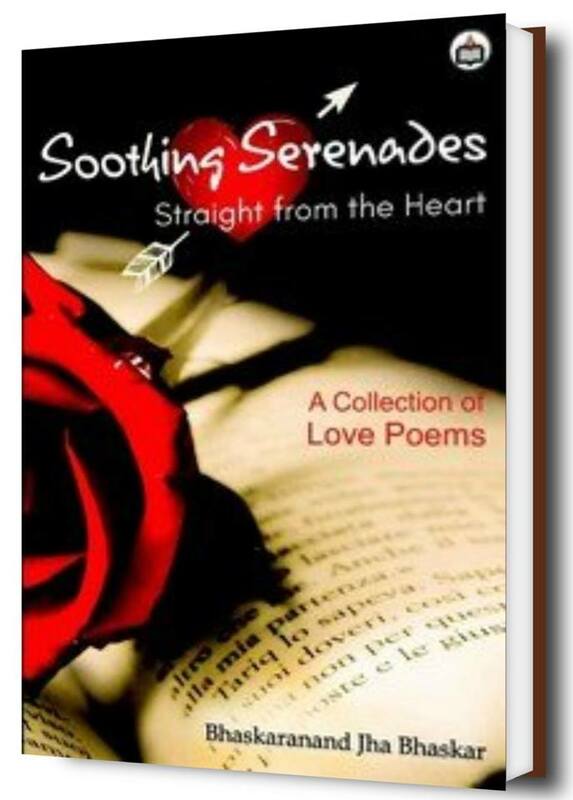 Bhaskaranand Jha Bhaskar’s "Soothing Serenades: Straight from the Heart" depicts the multitudinous thoughts and feelings which pass through the heart. It renders the flow of myriad impressions- visual, auditory, physical, associative and subliminal that impinges on the consciousness of an individual. Bhaskar Jha through his "Soothing Serenades" has made an eminent presence in the poetic world. His poems encompass a variety of emotional and mental states, ranging from the deepest interpersonal affection to the simplest pleasure, from the sensuous to the aesthetic. "Love loves to love love." His love doesn't talk only about an intense feeling of deep affection but also defines the ultimate truth of reality and tells us that love is also about great interest and pleasure in something. Thus, this profound belief of his compels him to write about 'platonic love' and 'cosmic world' where love meets and become one. Bhaskar Jha further talks about the four 'purusharthas ' and finds the path towards the metaphysical through the physical world. The poet evokes the imaginative world of readers with various terminologies and figure of speeches. His poetry is his expression with emotive imagery drawn from the world of nature too. He has a unique style of his own. His words convey deep meanings underlying in them which comes from the depth of his heart. Metaphorical use in "She" is an excellent example which sketches the glimpse of his love in the mind of the readers and gives the aesthetic pleasure while reading. The poet dwells in the beauty of his love through “Ocean of Love" and then says "Restless I Am For You". His intense love with 'fluttering feelings ' finds 'soothing solace' and 'soothing warmth' in 'soothing cocoon' and 'soothing canopy' through 'soothing glimpse' of his "her". The poet feels his love so deep that even in his thought if she appears alone, he becomes sad. Bhaskar Jha is definitely a love poet but his love hails in the biggest sphere being philosophical and spiritual. When in grief, the imaginative feel of his love soothes mind and soul. His love embraces his soul in the world of violence, hatred and jealousy. He finds love as an eternal source of joy which is more ecstatic than being desirous. He calls love the "Ventilation" through which he breathes new life. He shows his 'unflinching faith' for his 'her' in eternity of love that he has between the obstinate thoughts and undying feelings. He then turns towards 'Eternal Love' calling his love as Venus, Cupid, Aphrodite, Eros, Aurora whose 'pristine beauty' glows on spiritual throne and is as divine as Christ. Bhaskar Jha's love can never meet its end as it is beyond the horizon of territorial desert. He is highly imaginative and thinks beyond time and space. His love is not for a short period of time. It is beyond the earthly lust that's why he considers being a metaphysical lover. The poet reaches to the point where he admits the truth that his Valentine exists in him only. Thus it can be well said that Bhaskar Jha is a man with extraordinary insights and creates fusion with effortless ease. His images are striking and evocative which creates a world for readers to feel the ecstatic experience of divine pleasure. His vocabulary speaks high of his mastery over diction. The poetic journey with Mr. Jha through his well articulated vision will definitely give the warmth of love to readers. The book is a treasure of excellent poems, an unconventional take on love straight from the heart. The book is recommended for all the common readers, students and those who wish to learn writing love poetry. Happy reading..!